Unlike Google, Amazon does not have a neat a trend line. The solid yellow trend line is Amazon’s equivalent to the Google Forever trend line. The bottom line is that we should assume that Amazon remains in a bull market while price remains above this trend line. The more recent red channel is an attempt to show where price is more recently finding support and may find resistance. Note that during this bull market volume has shown a fairly steady decline, at least since January 2009 and probably before that. A bull market which is rising on light and declining volume is unsustainable, theoretically. The fact though is that Amazon has been rising on declining volume for years now. This decline in volume may indicate that eventually when a high is found the next bear market may be very fast indeed. There would be very little support below to halt a fall in price because volume is so light. Published @ 01:03 p.m. EST. Last analysis of Bitcoin expected more upwards movement, which is what has happened. Last published Bitcoin analysis is here. The “forever” trend line should be used to indicate when the top may be in for BitCoin. 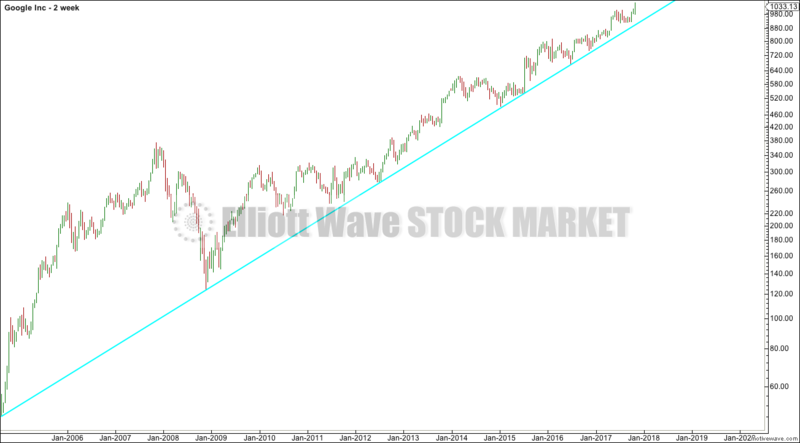 If this line is breached, the probability of a crash will increase (it will not be certain, only highly likely). Notice that Bitcoin completed strong blowoff tops at the end of both cycle waves I and III. 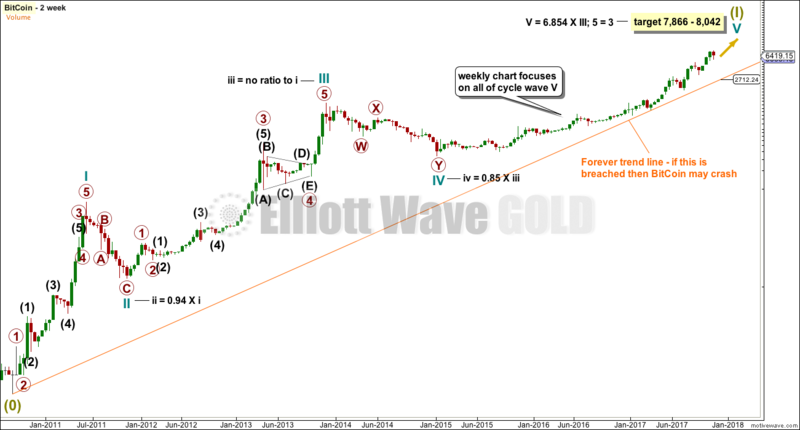 At the end of cycle wave I, the rise for the last eight weeks was vertical. Again, at the end of cycle wave III, the rise for the last eight weeks was vertical (remember, this is a two weekly chart). Notice that at this time the current rise is not vertical. Current price action looks more like the early stages of cycle waves I and III than their ends. If my targets are wrong, they may be woefully inadequate. I would not recommend using these targets for exit points for any Bitcoin purchases. Last analysis of Bitcoin expected more upwards movement, which is so far what is happening. Primary wave 3 may be complete as labelled. Primary wave 5 may turn out to be only even in length with primary wave 3, but it may well be much longer than that. 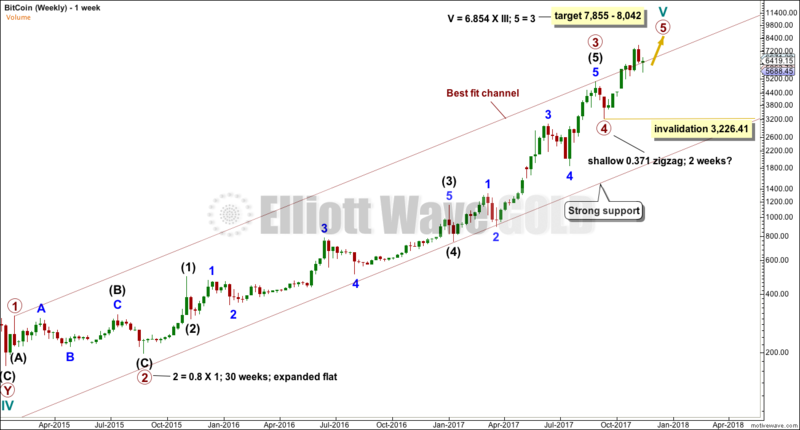 Within cycle wave III (not shown on this chart, see the two weekly chart above), primary wave 5 was just 26.45 short of 4.236 the length of primary wave 3. Here, if primary wave 5 were to exhibit the same Fibonacci ratio to primary wave 3, the target would be at 23,626. While this target may seem extreme, it is possible. At major highs, Bitcoin often exhibits strong candlestick reversal patterns. That is not the case at the last high. Single divergence with price and RSI at the last high signalled a likely pullback. The question right now is: is this pullback complete? At the end of pullbacks, Bitcoin does not always see RSI reach oversold. So that may not be useful in timing an entry. There are usually strong candlestick reversal patterns though, and there is one here. The last two days have long lower wicks and the last daily candlestick is very bullish. It is not correctly an engulfing pattern as the open gaps higher, but the close is well above the close of the prior day, which is very bullish. The risk here is that the pullback is not yet over. Some patience may be required. A smaller position may be entered here, and most powder kept dry for a larger position should Bitcoin move lower. Published @ 05:45 p.m. EST. In keeping with the KISS principle, this trend line is very simple. I call it “Google’s Forever Trend Line”. This trend line has very strong technical significance. It is very long held and has been tested multiple times. It does have a reasonably steep slope, but because the entire history of Google price remains above this line a breach of the line would still offer a very strong bearish signal. We should assume the upwards trend remains intact while price remains above the line. Each time price comes close to the forever trend line, and remains above it, then a low risk high reward entry opportunity to join the upwards trend is offered. Published @ 01:51 a.m. EST. I have tried to make it a bit easier by violating only core Elliott wave rules and making the mistakes really bad ones. Price points of all waves are given so you can calculate lengths and look for the mistakes. You can participate by either posting a chart or comment pointing out the five deliberate mistakes, or post a chart where you fix the wave count to remove the mistakes. It’s up to you. If making a comment, please refer to the degree of labelling the mistake is in. I encourage all members who find this a bit challenging to really give it a go. 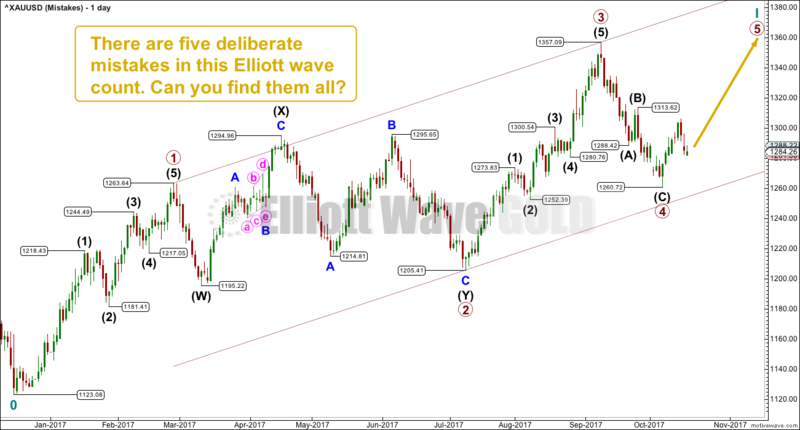 This should be a great exercise to really hone your Elliott wave skills. 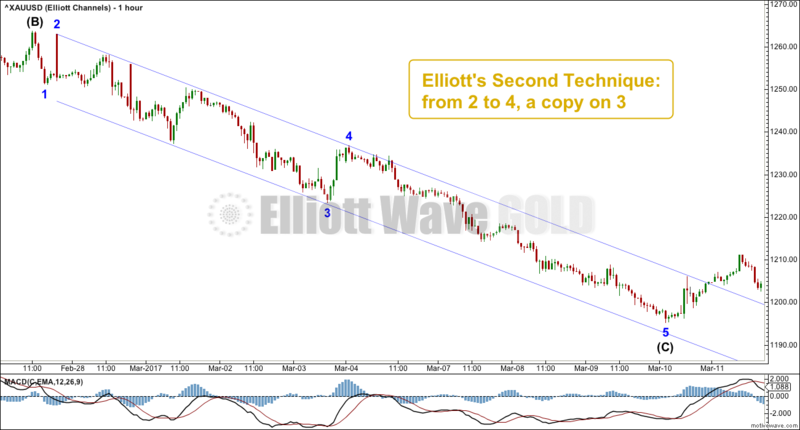 There are two mistakes which violate the same Elliott wave rule. One mistake is in a corrective structure, and to me it looks very obvious. 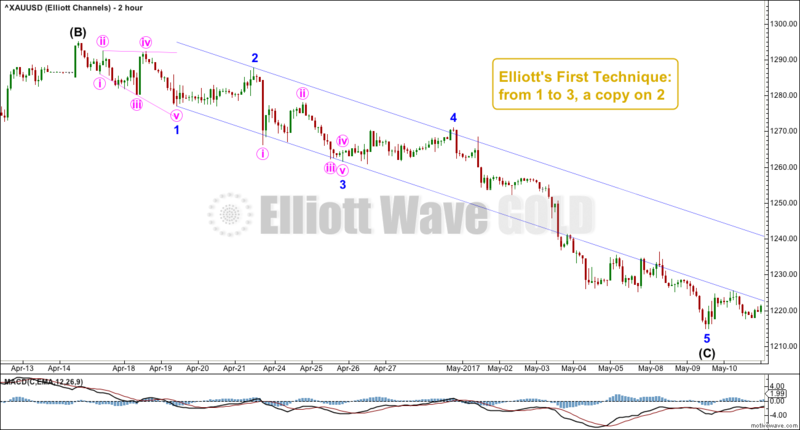 Another mistake violates a core Elliott wave rule, but it is a matter of judgement as to how the wave may subdivide on a lower time frame. 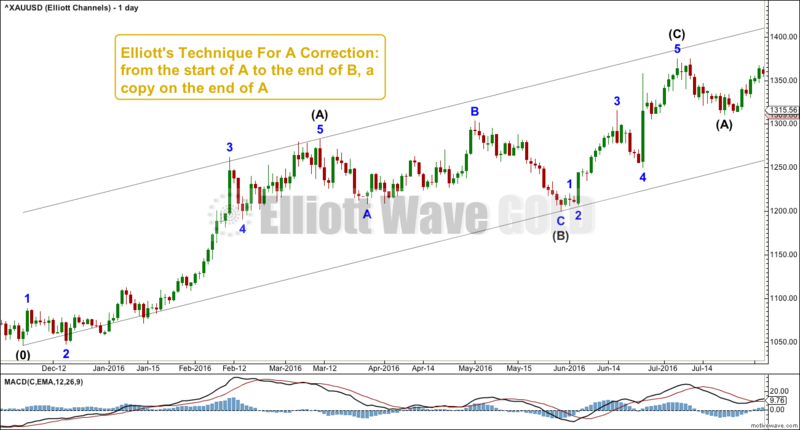 Another mistake violates a core Elliott wave rule, probably the most important core Elliott wave rule which should absolutely never be broken, ever. Answers will be posted tomorrow after tomorrow’s analysis is published. You have 24 hours. Have fun! Published @ 04:30 a.m. EST. When is it appropriate to use targets that are longer than 1.618? 1. 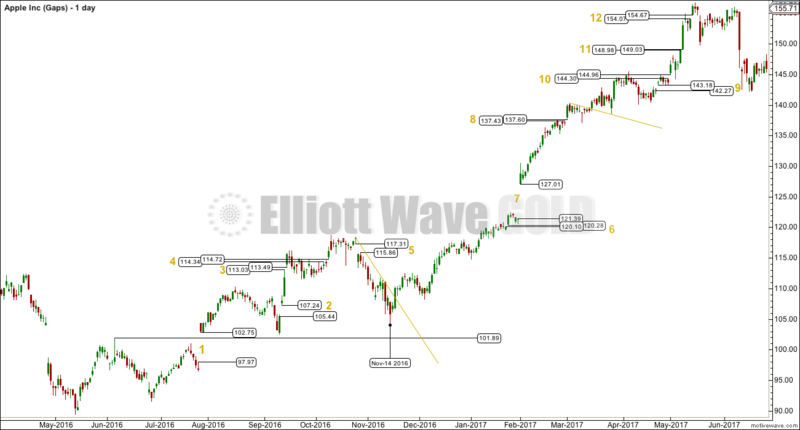 A first wave is very short, and a target calculation using only 1.618 would see the third wave not move far enough for a ratio using a higher degree to be reached. 2. Price reaches the first target using 1.618 and keeps moving through it. Then the next Fibonacci ratio in the sequence should be used. 3. The particular market analysed often exhibits extreme Fibonacci ratios such as 6.854 and 11.09. Bitcoin is an example of such a market. This behaviour can be determined by Fibonacci analysis of completed waves. 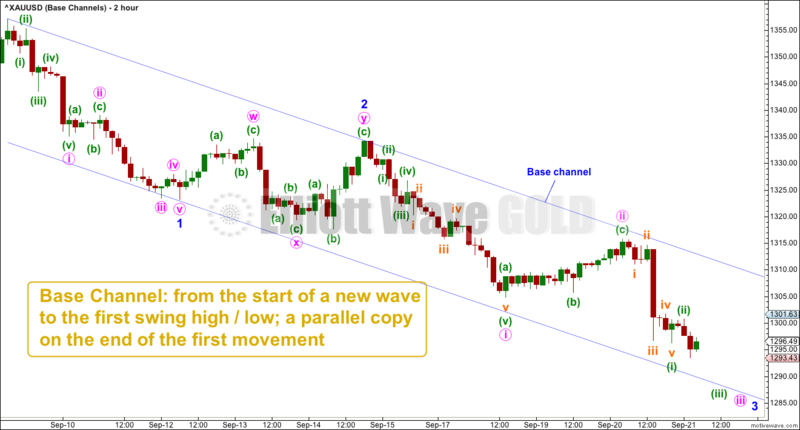 The chart above shows a fairly typical example of a third wave for Gold. Here, minor wave 1 was relatively short. The first target using 1.618 for minor wave 3 would have been reached about 1,488. The structure was not complete there, unless the end of minute wave i was labelled as minor wave 3. But it did not exhibit a very strong increase in downwards momentum, so although that could have been the end of it (and was suggested to me at the time) that would not have looked right. 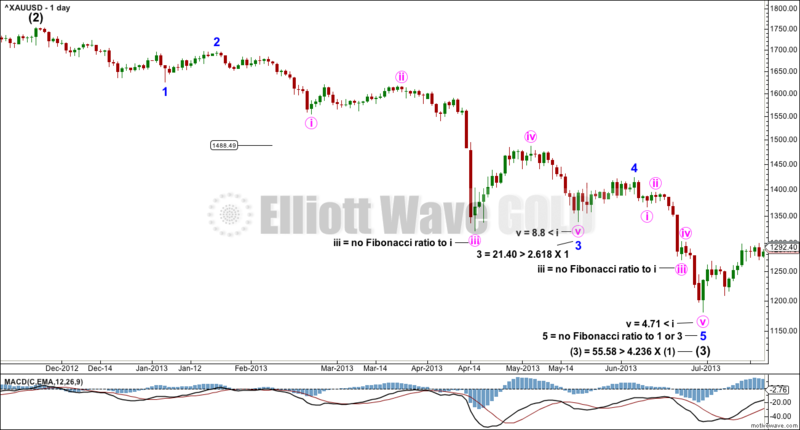 Intermediate wave (3) exhibits an extreme Fibonacci ratio to intermediate wave (1). 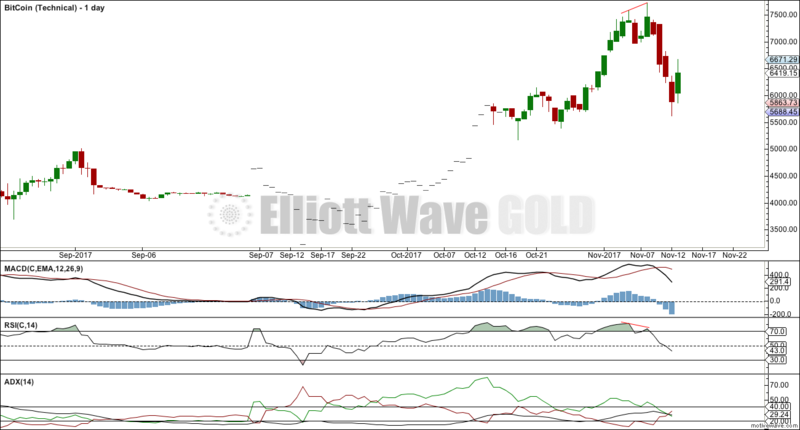 Intermediate wave (1) was very short. 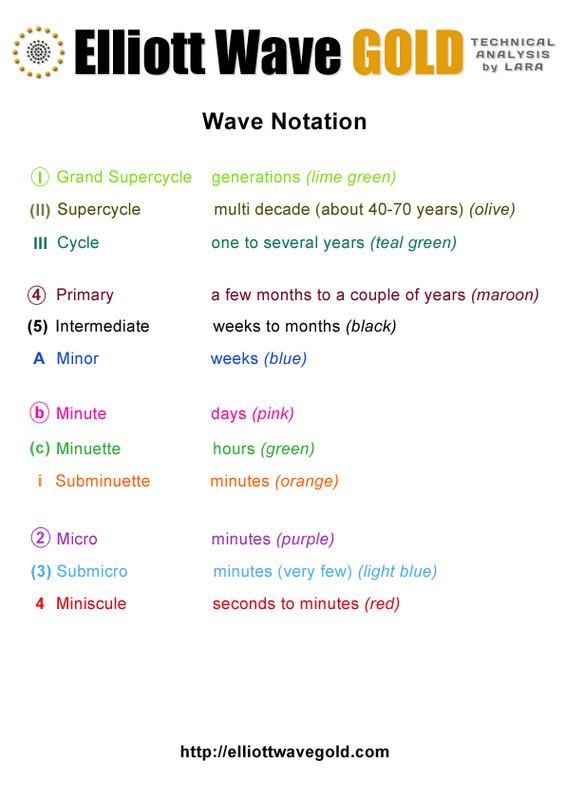 As intermediate wave (3) unfolded, it could have been labelled complete at the low labelled minute wave iii. The strongest argument against such labelling would have been that selling climaxes are usually the end of a third wave within a third wave, and not often the end of a third wave of a larger degree. Both of the fifth waves to end minor wave 3 and intermediate wave (3) exhibit ratios of equality in length with their counterpart first waves. Published @ 02:11 p.m. EST. This daily chart of the S&P 500 identifies 16 candlestick reversal patterns. Only reversal patterns are considered here, not continuation patterns. The first #1 and #2 patterns are both Three White Soldiers. Pattern #1 comes after a short sharp fall in price, so it may be considered a reversal pattern. But pattern #2 comes within an upwards trend, so it is more of a continuation pattern here and would not be considered a reversal pattern as there was nothing to reverse. For a reversal pattern to have meaning there must be something to reverse. A bullish reversal pattern should come after a decline in price. A bearish reversal pattern should come after a rise in price. Pattern #3 is an important reversal pattern and it does come after a steady rise in price. It correctly predicted a consolidation. Reversal patterns mean a reversal of the prior trend to the opposite direction or sideways. They do not only mean a complete 180 degree reversal; sideways is a direction too. The Shooting Star at #4 does not come after a bullish rally. It comes within a consolidation, so it should not be considered a reversal pattern. This is another illustration of point number 1. Likewise, the Bullish Engulfing pattern at #5 comes within a consolidation. There is nothing here to reverse. The Piercing Pattern at #6, however, does come after a short sharp fall in price, so it should be considered a reversal. It did correctly predict the following 7 days of upwards movement. Reversal patterns make no comment on how far price may travel in the new direction. The Morning Star at #7 is the second reversal pattern at lows after a short sharp fall. Along with the Piercing pattern, it correctly predicted the next rise in price. However, the Bullish Engulfing pattern at #8 does not come after a fall in price. It comes within a consolidation. There is nothing here to reverse, so it should be ignored. 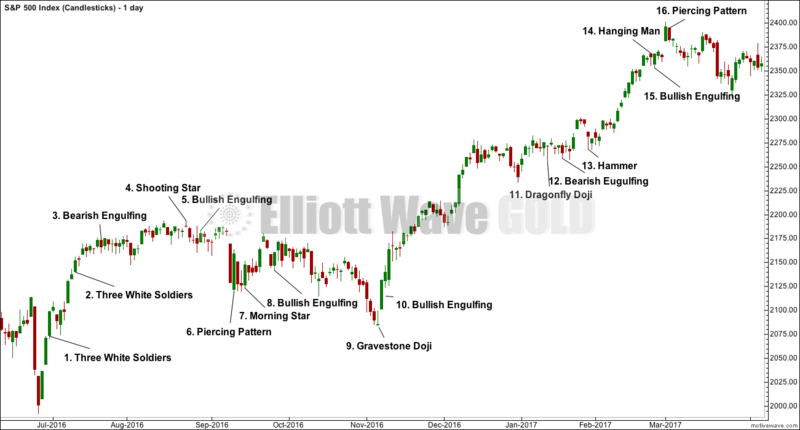 The Gravestone Doji at #9 is normally a bearish reversal pattern. Its forte is in calling tops. Here, it comes at the end of a bearish movement, so it is out of context. It cannot be calling a reversal in a bull move as there was no bull move prior to the pattern. At #10 the Bullish Engulfing pattern does come after a reasonable fall in price, so it should be considered a reversal pattern. This pattern was followed by a persistent bullish move. Like the Gravestone Doji, the Dragonfly Doji at #11 is out of context. Here, it is at highs and within a small consolation. Dragonfly Doji are bullish reversal patterns when they occur after a bearish move, but this one does not. Another pattern within the consolidation at #12 should be ignored. 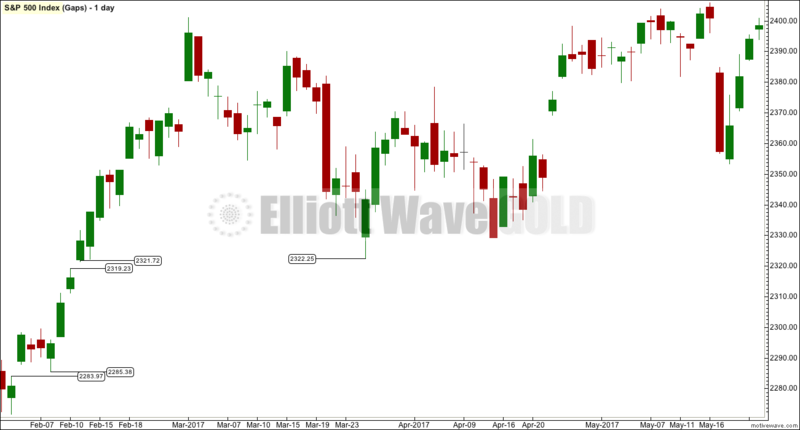 There is no bullish move here to reverse for the Bearish Engulfing pattern. The Hammer pattern at #13 does not come after a reasonable bearish trend; it was only the second day of a fall in price. There is nothing to reverse, so it should be ignored. The long lower wick is still bullish though. As a Hanging Man pattern it would require bearish confirmation in the following candlestick, which did not come. The Hanging Man at #14 though does come after a bullish move. But the bullishness of its long lower wick still requires bearish confirmation, which did not come. The following candlestick is quite the reverse; it is another bullish signal. As #15 comes within a small consolidation, it may be considered as a bullish signal. Finally, the Piercing pattern at #16 comes after a long upwards trend, so it should be considered as a bearish signal. Published @ 05:57 a.m. EST. Following on from the last two education posts on gaps here is an example of practical trading application. This daily chart of AAPL data shows at least 11 gaps. After a period of consolidation gap #1 appears. It breaks above an upper range from a consolidation, so it should be considered a breakaway gap. A position may be entered in the direction of the gap, with a stop just below the lower edge of the gap. Breakaway gaps should not be closed, so the lower edge should offer support if there is a new upwards trend. After some upwards movement price curves down to test support, but the breakaway gap remains open and so should long positions. Thereafter, another gap at #2 indicates another breakaway from the last consolidation. Stops may now be moved up to the lower edge of this gap. Another gap at #3 may be initially expected to be a measuring gap, which would give a target at 119.28. If this is a measuring gap, it should not be closed for a long time and the lower edge should offer support; stops may again be pulled up to just below it. But this gap is closed three days later, which should trigger an exit from a long position opened after gap #1 and which should yield a reasonable profit. 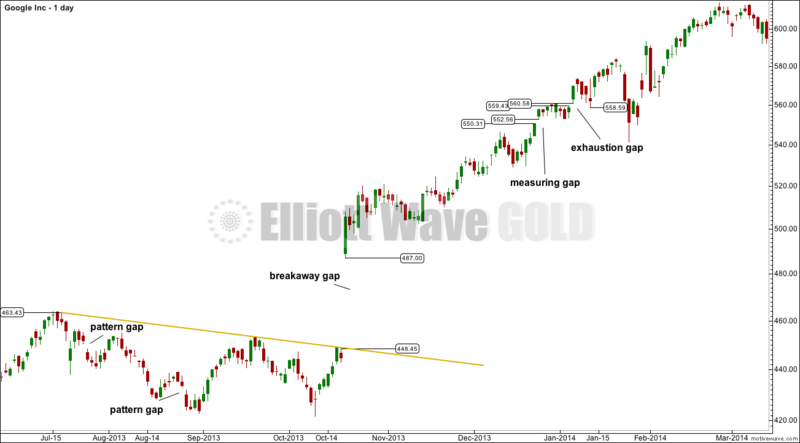 Gap #4 may initially be expected to be another breakaway gap after another small consolidation. It may trigger another long entry, but the gap is closed six days later for a small loss. Gap #5 is not a breakaway below support and should be considered a pattern gap. These are most often closed. This should not trigger any new position. After several days of falling price, a trend line may be drawn across resistance. When the trend line is breached, a long position may be entered or traders may choose to wait for another gap. There is not another gap until a few weeks later at #6. Gap #6 may be taken as another breakaway gap after a small consolidation. This may again signal an entry in the direction of the gap with a stop just below the lower edge. Four days later price curves down to test support and the gap remains open. Another large gap opens at #7. Given the size of this gap the appropriate measure for the movement before it may be the last reasonable swing low on the 14th of November. This gap looks like a measuring gap. A target may be calculated from the base of the movement prior to the gap and added to the upper edge of the gap. This gives a target at 144.32. Stops may again be moved up to just below the lower edge of the gap; it should provide support as measuring gaps should not be closed. Now some profit is protected on a long position with a target at 144.32. Gap #8 opens up prior to the target being met. This should be expected to be another measuring gap until proven otherwise. Stops may again be moved up to just below the lower edge of the gap to protect more profit. The new target would be calculated from the last rise from the last gap and added to the upper edge of the gap, giving a new target at 148.02. But this gap is closed six days later signalling it was an exhaustion gap and not a measuring gap. Positions would then be closed for a reasonable profit. After some further consolidation in which trend lines may be used to find another entry, or traders may wait for another gap, the next gap opens up at #9 a few weeks later. Again, this comes after some consolidation, so it may be either a pattern gap (it may be considered within a consolidation) or it may be a breakaway gap. A position may be entered in the direction of the gap with a stop just below the lower edge. If it is a pattern gap, a small loss may be incurred. If it is a measuring gap a good entry point for the next upwards movement may be found. Price curves down to test support at the upper edge of the gap two and three days later. The gap remains open and long positions remain open. Another gap opens at #10. This may be another breakaway gap, but coming so soon after the last one it may also be a measuring gap. The move prior to it is small, so the target would be calculated from the move prior to the gap and added to the upper edge of the gap, giving a target at 146.08. This target is met the following day, so positions may be closed for a profit. Two days later the gap is closed indicating it is an exhaustion gap and not a measuring gap. No new positions should be entered as price may be entering a larger consolidation. Another gap opens up at #11 on a strong upwards day. This may be another breakaway gap, so a new position in the direction of the gap may be opened with a stop just below the lower edge of the gap. The last gap opens up at #12. This may be another measuring gap, so it should not be closed. Stops may be moved up to just below the lower edge of the gap, which would now protect some profit. A target calculated from the rise prior to the gap added to the upper edge of the gap gives a target at 159.69. This target is not met and the gap is closed three days later as the stop is hit yielding another profit. Conclusion: Gaps can be useful for trading in markets where they appear regularly. Some patience is required in holding onto positions, which may be underwater for the first few days, but overall this approach may yield more profit than loss. Small losses are inevitable and risk must still be managed. Published @ 05:32 a.m. EST. Not all gaps have to be closed. So how can we know which gaps are going to be filled and which ones aren’t? The answer lies in what type of gap the gap may be. The above chart of Google shows daily data. Equities more commonly have gaps and session only data of indices often does too. Forex rarely has gaps because forex markets are open 24 hours. These gaps are the ones which are almost always closed. Only the very last gap within a consolidation may not be closed. These gaps suggest a congestion area is forming. They are not useful in trading. These are the most profitable gaps. After a period of sideways movement draw trend lines to determine support and resistance for the consolidation. A breakout above or below the zone accompanied by a gap signals the end of consolidation and the return of a trend. Breakaway gaps are rarely closed within any reasonable time frame. They may be used as areas of support or resistance to set stops. If the gap is filled reasonably quickly, then it is unlikely to be a breakaway gap. These are gaps that occur within a clear trend. Assume such a gap is a measuring gap until proven otherwise. Proven otherwise means until the gap is closed. Measuring gaps are not closed within any reasonable time frame. They may be used as areas of support or resistance, and to place stops. They may also be used to set targets. They often occur about mid way within a price run, so calculate the distance of the pole prior to the gap and add that to the end of the gap to give a target. These gaps are closed within a relatively short time frame. As soon as the gap is closed, it indicates an end to the price run and the start of either a trend change or a period of consolidation. Exhaustion gaps are filled within a few candlesticks. Published @ 04:53 p.m. EST. The answer to the question is in the charts. If gaps can be seen, which were not filled, then not all gaps must be filled. Some markets have more gaps than other markets. Gold is a global market and rarely has gaps at the daily chart level, but it may have gaps occasionally at the hourly chart level and below. The S&P500 is a good example of a market with gaps. There are two examples of gaps not filled in the daily chart above for the S&P500, from price movement during February of 2017. To this day, 8 months later, these gaps remain unfilled. Published @ 05:10 p.m. EST. 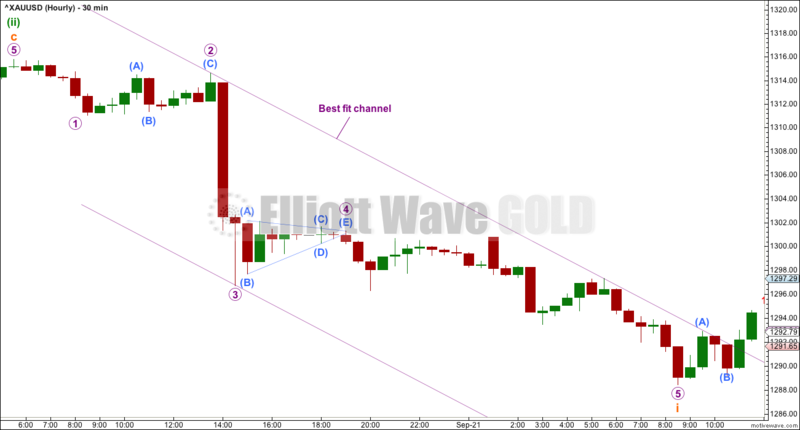 If an Elliott channel does not fit a movement, then a best fit channel has to be drawn. The best fit is a channel which contains most or all movement within a trend and is tested the greatest number of times. A channel drawn about this impulse using either of Elliott’s techniques does not contain all movement. 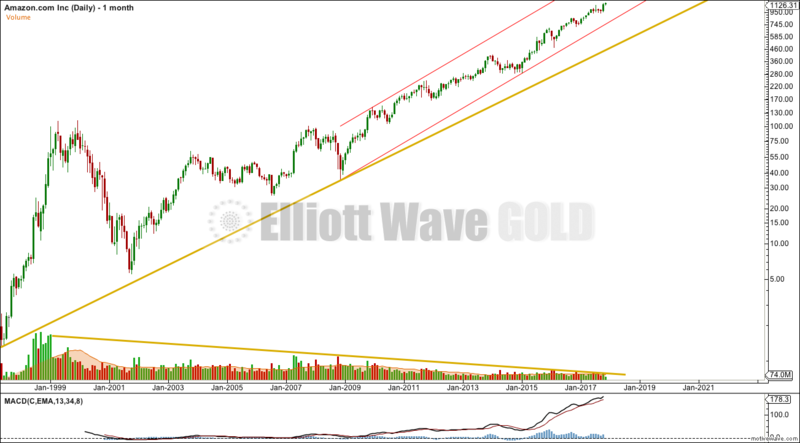 Therefore, when compared to a best fit channel, Elliott’s channel drawn this way may not be as reliable in indicating when the movement has been over and there may have been a trend change. Redrawing the channel as a best fit now contains all the impulse. Therefore, for this impulse on this chart, this best fit channel should be a more reliable and more conservative indicator of a trend change. Channels drawn using Elliott’s techniques, outlined here, cannot be drawn until a reasonable amount of a wave has completed. There are two techniques to draw a channel about a new movement earlier. This is the earliest channel that can be drawn about a new movement. This channel was drawn at the end of minor wave 2. 1. As the wave progresses the edge which is opposite to the main direction of movement should provide support or resistance. Here, the wave is down and the upper edge should provide resistance to bounces along the way down. It is the opposite for a bull wave; the lower edge should provide support for pullbacks along the way up. A sloping trend line offering support or resistance can be used to place trailing stops. 2. 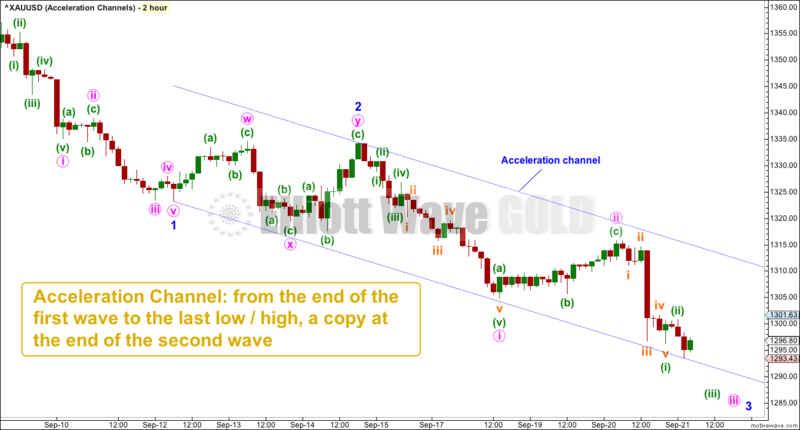 A third wave may be identified or confirmed if it has the power to break through the base channel in the direction of the trend. 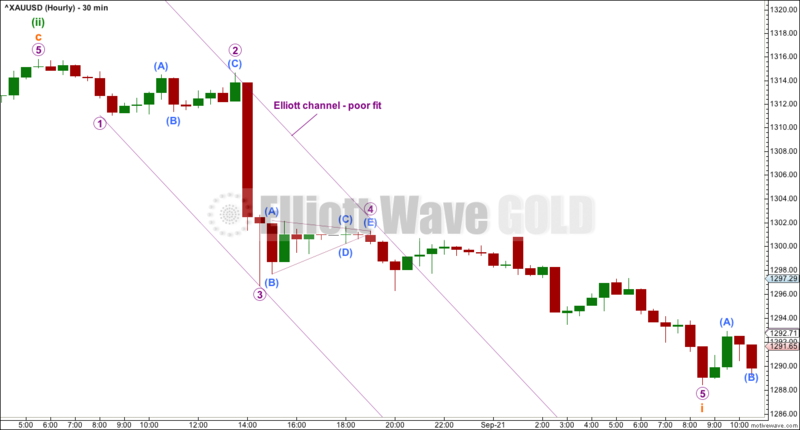 A third wave should have the power to break above resistance at the upper edge of a base channel for a bull wave. Here, minor wave 3 should have the power to break below support at the lower edge of the base channel. Later on in the development of a wave the base channel may be redrawn as an acceleration channel. This may be done after a third wave shows enough power to break out of the base channel in the direction of the trend, or it may be done earlier. Acceleration channels are redrawn each time price makes a new extreme in the direction of the trend. When a third wave is complete, then this channel is an Elliott channel (drawn using the first technique). 1. To show where corrections within the trend find support or resistance, on the side opposite to the trend. The side opposite to the trend may be used to place a trailing stop when trading the trend. Published @ 06:22 a.m. EST. This is my favourite trade set up. Here’s what to look for and why. To begin, look for a trend line which has strong technical significance. In deciding how strong or weak a line is use these guidelines here. 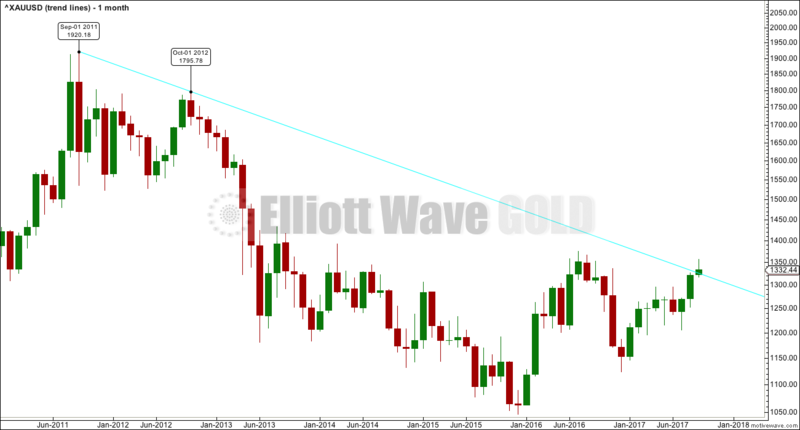 This trend line on Gold’s monthly chart is drawn as a bear market trend line as illustrated here. Zooming on at the daily chart level to see exactly where the line sits, we can see that price is not sitting perfectly upon it. That may be because this trend line extends so far back, to September 2011. The general idea does appear to be working here today though. Look for a breach of the trend line. If this is achieved on strong volume, then have more confidence in the breach. StockCharts data does show very strong volume for the 5th of September, which is the daily candlestick on their data that would have been the day of the breach. Look for price to curve around and back test support at prior resistance (or in a bear market resistance at prior support). Enter in the direction of the larger trend when price tests the trend line. This set up takes time. 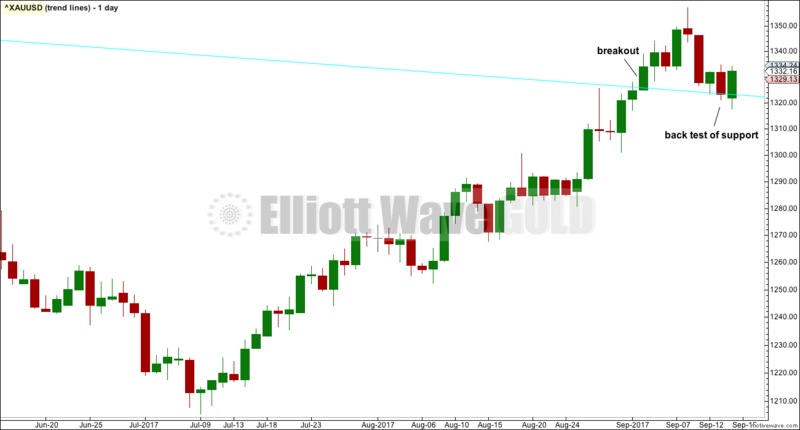 In this case a wait of 7 to 8 days after the initial break above the trend line. 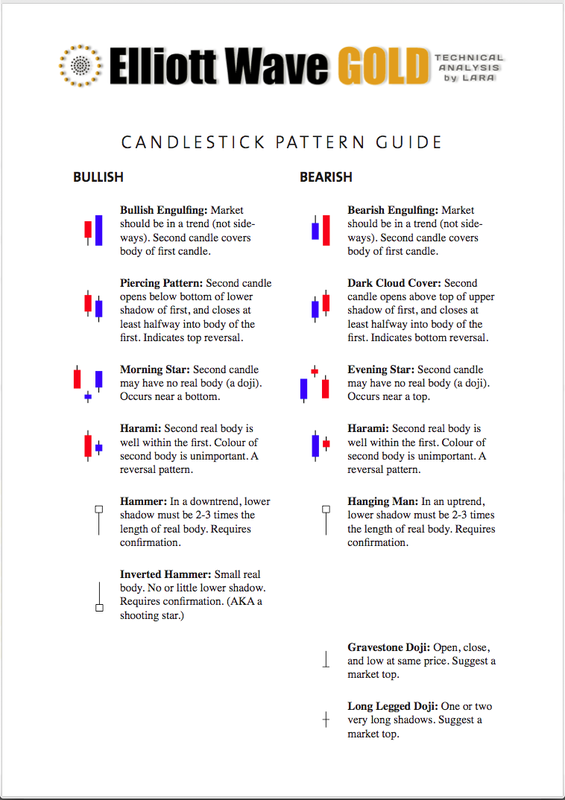 Today, the long lower wick and bullish engulfing candlestick pattern offer a little more confidence in this set up. Why is this such a good trade set up? With a technically significant trend line, the set up offers an entry point to a trend which traders may have confidence in. The more significant the line, the more significant the breach. Stops may be set quite close by. Allow a little room for overshoots, and for longer held lines slightly larger overshoots, but stops may be closer than the last swing low or high. This reduces risk. Published @ 01:15 a.m. EST.